The Rocket who had squeezed into the line up after some indifferent form of late showed he still had the ability to beat anyone in the game- including the reigning champion. A tense first frame should have gone the way of the Chinese star. O’Sullivan’s miss on a routine black handed the initiative to Ding. Ding’s inability to take full advantage, faltering on 58 handed Ronnie a chance. And he made no mistake as he drilled in a long red and mopped up with a 36. It was a bitter blow for Ding and he was left to rue his missed opportunity as the rocket doubled his advantage for 2-0 lead with a 57 before Ding finally managed to open his account, taking the third to close to 1-2. But O’Sullivan remained unruffled and promptly ran in a 76 to lead 3-1 at the mid session interval. Returning from the interval Ding was once again sitting in his chair as the Rocket blasted his way into a 4-1 lead as he fired in a 62 to account for the fifth frame. 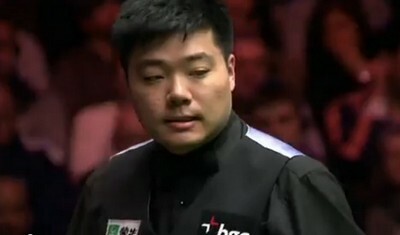 The Champions’s crown was slipping away from Ding and he looked set to go 1-5 behind, only for O’Sullivan to miss on 36. It handed a lifeline to Ding, and he grabbed it- though with an audacious fluked red which jawed in the top left pocket before shooting across to the opposite corner pocket and dropping in. From there he cleared up to trail 2-4. Now with some sort of foothold in the match Ding made a swift 59 before having to scurry to safety when he inadvertently cannoned into the black after sinking a routine red. It was still pottable, but far more difficult than it should have been. As Ding saw the black jaw in the corner pocket he retreated to his seat. Seconds later he was back at the table as Ronnie missed a red to the centre leaving Ding a chance to put the frame beyond any doubt. Taking it Ding put together a 32 to cut his deficit to 3-4. But could Ding now restore parity. The answer was to be yes as O’Sullivan missed with a cut red to the centre allowing Ding to the table. An initial 20 gave Ding the advantage in the frame, one he was not to surrender as with bits and pieces he levelled at 4-4. Ronnie’s response was to be clinical as he stroked in a 51 only to run out of position. Ding though couldn’t capitalise and it was Ronnie who minutes later completed the formalities as he moved to 5-4, within one frame of victory. Could Ding force his way back into it. The answer was a resounding no as O’Sullivan closed out the match in style with the help of a 125 to finally put paid to his gallant opponent 6-4 and set up a showdown with either Stuart Bingham or Judd Trump.